Earlier in the month, my paper “The Notational Identity of Late Medieval Composers and Their Scribes” was read at the Medieval and Renaissance Music Conference at the Centro Studi sull’Ars Nova Italiana del Trecento, Certaldo (Italy) as part of a Panel session convened by Karen Cook (Assistant Professor, University of Hartford) on “Theory and Notational Practice(s) in the Fourteenth Century”. Unfortunately I was unable to attend the conference to deliver the paper in person, and I am most grateful to Karen Cook for volunteering to read it in my absence. I was, however, able to answer questions “remotely” over Skype after the reading of my paper, a novel if not “exhilarating” experience. Did late medieval composers use music notation as a form of self-representation? In light of recent literature on late medieval authorial self-representation, I propose that around the year 1400 distinctive note shapes, notation puzzles or other elements of musical handwriting increasingly served to identify the composer of a musical work, similar to an author, painter or sculptor signing their own work. From this theoretical premiss, music paleographers might begin to explore the notational identity of composers or their scribes. I discuss examples of idiosyncratic notation that, despite their mediation through the pens of anonymous scribes, point towards composers such as Jacob de Senleches, Philipoctus de Caserta and Matheus de Perusio using musical writing as a medium of self-representation, or at the very least, for stamping their identity upon their notated compositions. As an extension of this approach, I select examples of notation wherein the scribe of a particular manuscript has left traces of his own identity upon a musical work’s notation. In doing so, I intend to highlight a latent epistemological tension between the composer as scribe and the active copyist. In my paper, I was interested in exploring an analogy between the signatures that appear on artworks and the writing-out of musical compositions. Artists began signing their artworks more often in the late middle ages, although the way they did so varied. One discussion I found particularly insightful was that of Rona Goffen (“Signatures: Inscribing Identity in Italian Renaissance Art,” Viator 32 (2001): 310–11, doi:10.1484/j.viator.2.300740) who distinguishes between heterogeneous and homogenous signatures in artworks of the late middle ages and early renaissance. A heterogenous signature is one that occupies the frame of an artwork. 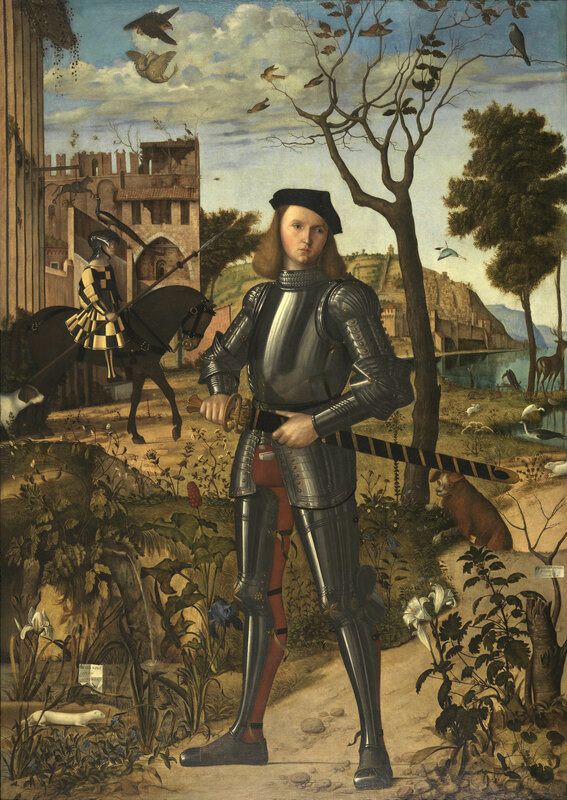 It sits outside the composition and narrative of the painting or sculpture. The homogenous signature is where the artist has incorporated his name into the narrative of the artwork, for example on a little scrap of paper painted lying on the ground, or as the letters “carved” into a painted block of stone. Importantly, both signatures are rarely “signatures” in the “John Hancock” sense, but are stylised representations of the artist’s name, often as a Latin inscription that includes words like “fecit” (“he made” in the sense of a completed artwork) or, in the case of humanists, “faciebat” (“he was making” or “he did make” in the sense of an incomplete artwork still striving for perfection). 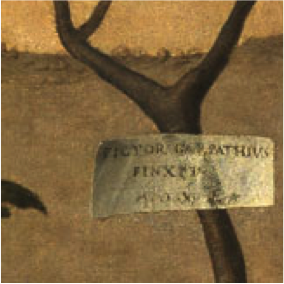 “Pinxit” was also commonly used, as in the case of the heterogenous signature at appears on a scrap of paper (a cartellino) hanging from a bush in the bottom right hand quarter of Carpaccio’s Young Knight in a Landscape (Thyssen-Bornemisza Collection, Madrid). However, one of the distinctive features of late fourteenth-century musical notation is the proliferation of different ways of writing music. When we sit back and examine the use of unusual note shapes, for example, it seems that some composers use their own distinctive notes as if to set their musical notation apart from their contemporaries. I see this feature of late fourteenth-century music notation analogous to the homogenous signature: distinctive note shapes function as indices of a particular composer’s identity. But only experienced singers would have recognised these “signatures” when they were reading from the notation, possibly simultaneous with the recognition of an individual composer’s style (if they had performed/heard the composer’s music previously). This situation in many respects parallels the role of art connoisseurs in recognising the unsigned art works of master artists: Michelangelo, for example, only ever signed one of his works (his Pietà), but many more works were/have been recognised (and confirmed through documentary evidence) to be his. A handful of composers standout for using notation in this way. Their notation serves a double purpose of indicating things like intricate musical rhythms and also hinting at their compositional identity. In the realm of note shapes, composers like Jacob de Senleches, Rodericus, Matteo da Perugio and Philipotto da Caserta use distinctive notes in their written compositions. These composers were the focus of my paper. There are, however, other distinctive notational practices that might also function as “notational signatures” such as the use of exuberant and mostly superfluous proportion signs by Baude Cordier, the mensuration canons that one finds in the works of Johannes Ockeghem or the use of archaic mensuration signs by an anonymous composer in the Missa L’Ardant desir. I intend to discuss these in a future study. This research also broaches an important question concerning the role of scribes and their “scribal identity”. It is quite clear that music scribes could not resist changing their exemplars even in the case of complex notation like Jacob de Senleches’s. There are many instances, some of which I touched upon in my paper, where a scribe has chosen to stamp their own identity upon the notation of another person’s composition. In the late middle ages, part of this phenomenon stems from the constant desire of scribes to gloss and update their exemplars. This raises all sorts of interesting questions about “authorship” and authority that will also be part of a larger study. When it comes to mensural or rhythmic music notation, which was just over a century old at the end of the fourteenth century, new ideas and ways of writing musical notation were coming with a frequency that would surprise us today in an age that despite some experimentation has largely decided to stick with the same form of music notation for the last three centuries. Music scribes, who were often musicians or music theorists, put these new ideas into practice, changing their exemplars as they felt necessary. Attempting to map the individuality of these scribes, and indeed trace their activity over a particular range of surviving manuscripts is one of the long-term goals of my research on late medieval music notation.